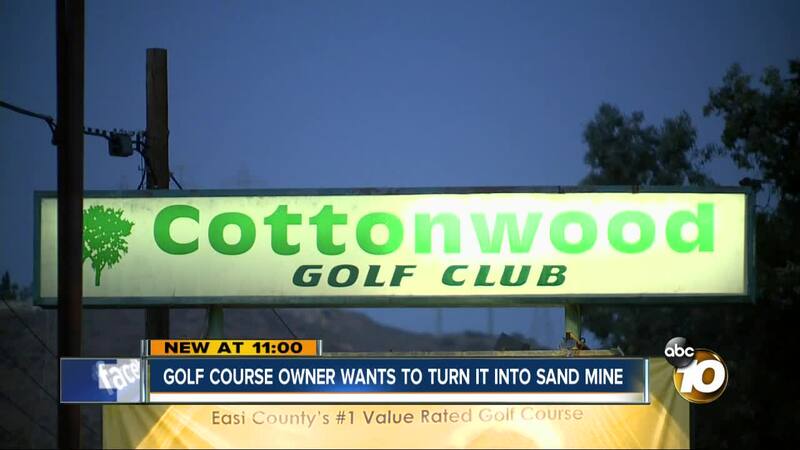 EL CAJON, Calif. (KGTV) - The owners of the Cottonwood Golf Club in El Cajon have filed an application with the county to convert the property into a sand mine. Details were revealed at the Valle del Oro community planning group meeting earlier this month. The proposal calls for a three-phase mining operation over 10 years. The first phase would take place on the course west of the Steele Canyon bridge, which has already been closed to golfers. Sand is needed as a component of concrete, which has become scarcer during the construction boom of the past decade. The mine would produce a maximum of 570,000 tons a year, creating an estimated 170 heavy truck round trips a day from the site. The property is owned by Beverly Hills real estate agent Michael Schlesinger, who also owns the shuttered golf courses at Stoneridge Country Club and Escondido Country Club. 10News reached out to EnviroMine, the consulting company involved in the plan. They said they would comment at a later date. Barry Jantz is one of the organizers who argues a sand mine is not compatible with the neighborhood. “The character of the neighborhood would be impacted,” said Jantz. More specifically, he says they are worried about the noise and traffic from the trucks, as well as pollution, environmental impacts and the potential to decrease property values. They will be holding a meeting at the Rancho San Diego library on Wednesday, November 27 at 6 p.m.